Among all the turbines, impulse turbine widely used in hydro-electric power plant. Turbines are the modern version of Water Wheels which are used to generate electricity. So, Working on many considerations, engineering-minded people had developed different types of Turbines. As the name indicates, An Impulse Turbine is running the impulse of water. In an impulse turbine, the water from the dam flows through the pipeline then through guide mechanism and finally through the nozzles. In this transportation process of water from the dam to turbine, the entire available energy of the water is converted into Kinetic Energy by passing through nozzles. These nozzles are kept as much as close to the runner. The water enters the running wheel in the form of Jets, which impinges on the buckets, fixed on the outer periphery of the wheel. The energy to the runner is imparted by the jet of water impinges on the buckets with high velocity. Hence the pressure of water at entering and leaving the vanes is atmospheric. To measure the efficiency of Impulse Turbine, we can use following three types of efficiency. 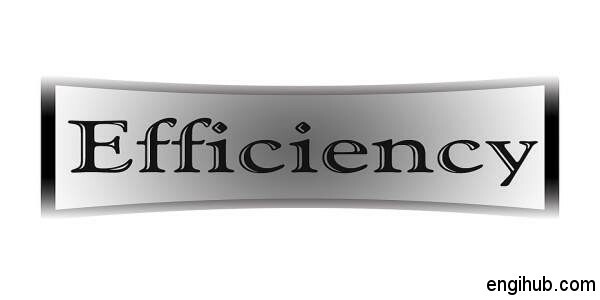 Basically, in engineering, efficiency is the ratio of work done by the turbine to the energy supplied. It is the ratio of work done on the wheel to the energy of the jet. In practical, it is observed that all the energy supplied to the wheel does not come out as the useful work. Some energy is wasted to overcome the friction of bearing and other moving parts. Hence keeping this point in mind, the mechanical efficiency is the ratio of actual work available at the turbine to the energy imparted to the wheel. It is the ratio of actual power produced by the turbine to the energy actually supplied by the turbine. With this efficiency, you can measure the performance of the turbine.